"People don’t change overnight. It doesn’t matter what the law says. You can have a civil rights act, you can make abortion legal, but you still have to deal with what people feel and think. And that’s what it’s all about. You slowly have to persuade people and hope they are reasonable enough to see things in a logical, objective way." Billie Jean King -- Particular Passions: Talks with Women Who Shaped Our Times. For a limited time -- enjoy the oral biography of Billie Jean King from her days on the court. "Take the Bobby Riggs match, for instance. To beat a fifty-nine-year-old guy was no thrill for me. The thrill was exposing a lot of new people to tennis. But the most important thing about the match was that women liked themselves better that day. In Philadelphia a few weeks later, I walked into the offices of the Bulletin to meet the editor, and all the secretaries stood up and clapped. They just went berserk. The editor said, “You have no idea what you did. The day after you played Bobby Riggs,all of these women asked for a raise.” Billie Jean King -- Particular Passions: Talks with Women Who Shaped Our Times. The oral biography of Billie Jean King from her days on the court. "Perfection is something you never reach, although you keep trying. Always. It’s being in perfect balance. If you’re planning a topspin backhand, that’s exactly what you produce. That doesn’t happen very often. Even if you hit it almost perfectly, you think, Maybe I could have hit it just a little closer to the line, a little bit harder or softer. You just keep extending yourself. It’s fun to see if you can do it." – Billie Jean King, from 'Particular Passions: Talks With Women Who Shaped Our Times' by Lynn Gilbert. Enjoy the oral biography of Billie Jean King from her time on the courts -- through Facebook for a limited time. Billie Jean King – The oral biography from her days on the court. "I do something because I want to do it, not because I feel a sense of responsibility. Sacrifice is doing something you don’t want to do. Yes, I get tired, cross, lose my temper, get ticked off, and sometimes I don’t feel appreciated, but as I told the women players when we started with Gladys and Joe, “If you think that we’re going to be appreciated ten years from now, I got news for you. You should get joy and gratification out of it now. You know that you’ve done it. If that isn’t enough for you, don’t bother." – Billie Jean King, from 'Particular Passions: Talks with Women Who Shaped Our Times', the oral biography of Billie Jean King, who created opportunities for women on the tennis court and in the workplace, and who continues today to champion social change and equality around the world. For a limited time, enjoy a this complimentary chapter of Particular Passions -- the oral biography of Billie Jean King from her days on the court. Available at Facebook. Available at Amazon and Apple. Billie Jean King – HERSTORY. "I don’t think about the past too much, only if it’s going to help me today. The danger of thinking about the past all the time is that you live in the past. A lot of athletes do that. They remember when they were number one. That’s all they talk about to their friends. How boring. You don’t want to hear about somebody who was champion in 1958. They don’t live in 1958, they live in 1981. I get burned out a lot, sure. I take a rest and then get charged up again. I want to shape the todays and tomorrows." – Billie Jean King, from 'Particular Passions: Talks with Women Who Shaped Our Times', by Lynn Gilbert. The oral biography of Billie Jean King, who created opportunities for women on the tennis court and in the workplace, and who continues today to champion social change and equality around the world. "People don’t change overnight. It doesn’t matter what the law says. You can have a civil rights act, you can make abortion legal, but you still have to deal with what people feel and think. And that’s what it’s all about. You slowly have to persuade people and hope they are reasonable enough to see things in a logical, objective way." – Billie Jean King, from 'Particular Passions: Talks with Women Who Shaped Our Times'. For a limited time, enjoy a this complimentary chapter of Particular Passions, the oral biography of Billie Jean King from her days on the court. Available at Facebook. "I was eleven when I took up tennis at the public parks in Long Beach, California. The first day I hit the tennis ball I knew I’d found what I loved doing. There was something special about hitting the ball, the way it felt. There wasn’t a doubt in my mind." "Working to change things gives me the most long-term happiness. Performing is very temporary. To me, winning is doing what I want, what makes me happy, doing the best I can at this given moment in my life. That’s all I can ask of myself. If each person does the best with what he has, that’s winning. He’s fulfilling his own potential." — Billie Jean King, in Particular Passions: Talks with Women Who Shaped our Times. "There are those who look at things the way they are, and ask why... I dream of things that never were, and ask why not?" - Robert Kennedy. Billie Jean King was a dreamer and put those dreams into action. Look what she accomplished: from a tennis player, to a champion, to bringing about women's equality in sport, then bringing about greater equality in the workplace first in America, and along with others around the globe. Read her story in Particular Passions: Talks with Women who Have Shaped our Times. This is a story for all people who want to see how dreams can turn into reality.... how you make it happen ...and it isn't magic. This chapter isn't about tennis, or even sports, it's about how people put their dreams into action. "...you can’t force people. ..You can be persuasive if you explain to people that it is in their self-interest to do something…" Billie Jean King from Particular Passions. The New Year is fast approaching, be inspired by someone who dared to dream and make that dream come true. Enjoy this brief and inspirational chapter on your kindle / ipad. 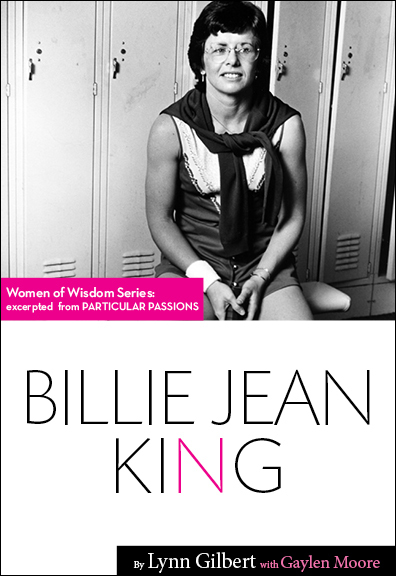 I am thrilled to share the the oral biography of Billie Jean King, a chapter from Particular Passions: Talk with Women Who Shaped Our Times, is now available at Apple's itunes store. This is one of 12 chapters from the book, originally published in 1981, and now available for today's e-readers. These stories will captivate, educate and inspire you.